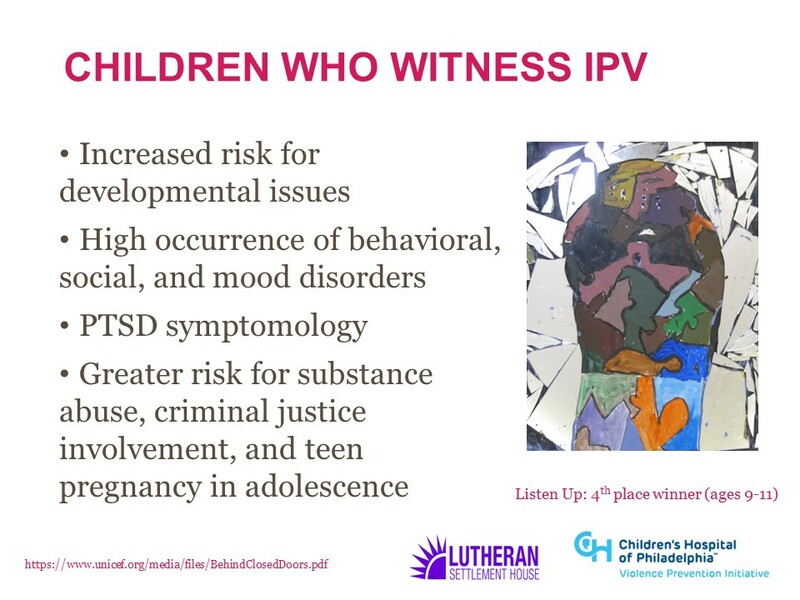 Last week, CHOP's Violence Prevention Initiative (VPI) and Lutheran Settlement House (LSH) hosted a webinar: "Intimate Partner Violence and Pediatrics." The two hour session defines intimate partner violence (IPV) and its effects on victims and their children, provides safe techniques for screening and documentation, discusses strategies to overcoming barriers and challenges to screening for IPV in the pediatric setting, and provides recommendations for establishing partnerships with appropriate resources/providers in the community. The webinar is presented by Ashlee Murray, MD, MPH, attending physician in the Emergency Department at CHOP and VPI Fellow, Marcella Nyachogo, LSW, assistant director of the Bilingual Domestic Violence Program at LSH, and India Azzinaro, BSW, medical advocacy supervisor at LSH and CHOP and VPI Fellow. The moderator is Rachel Myers, PhD, a Research Associate at CIRP@CHOP and VPI Fellow. Click here to access a recording of the live webinar and a PDF of the presentation.